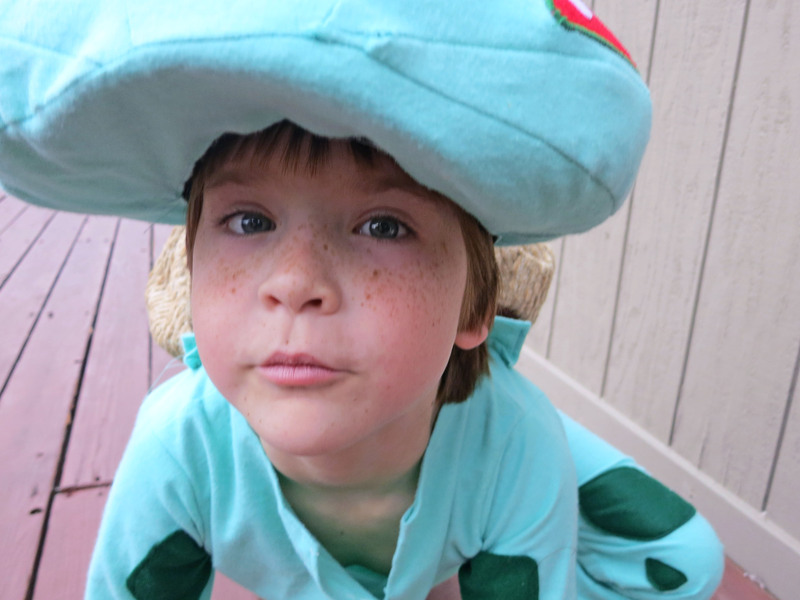 This year Simon requested a Pokemon costume, specifically a Bulbasaur. I was glad his costume was going to be made of cloth, since his brother’s costume required no tailoring. I really look forward to Halloween as a time to release my inner seamstress. 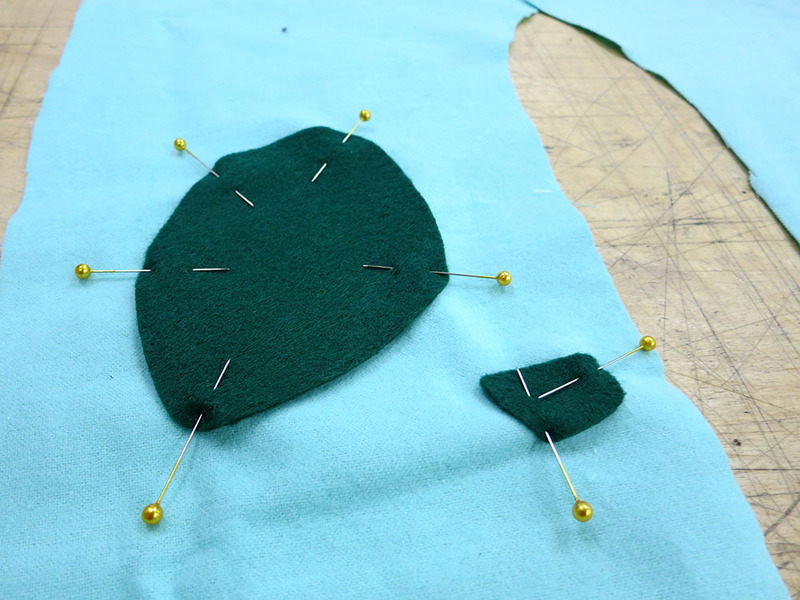 I went to the fabric store with a picture of a Bulbasaur, and I got some material to build the costume. I chose a lightweight flannel that seemed to be reversible. That way I wouldn’t get stuck cutting something out the wrong way round. It was the perfect aqua-green color, and Simon could have fuzzy comfort. I chose fairly accurate colors for the body and spots, but I went for a more organic-looking material for the bulb. Something a little less GREEN. 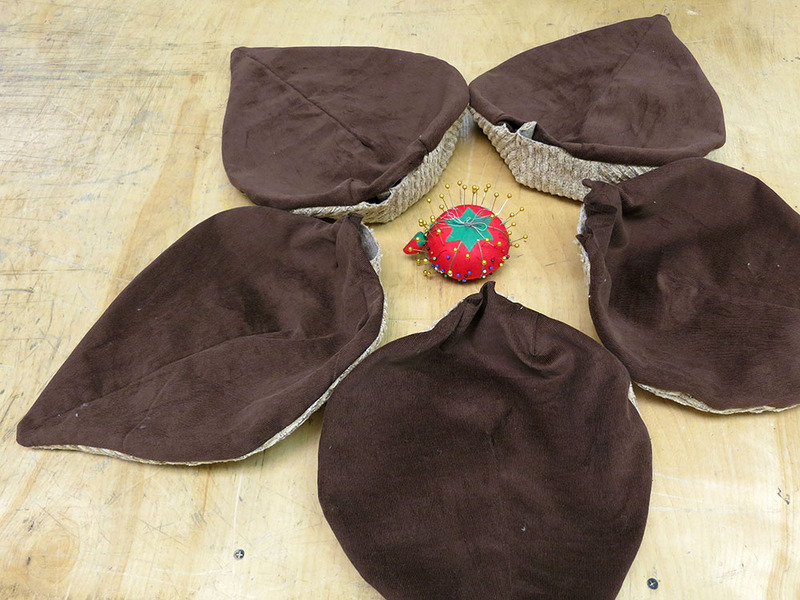 I also got some dark brown corduroy because I was hoping to make the bulb a functional backpack, which required a dark liner. 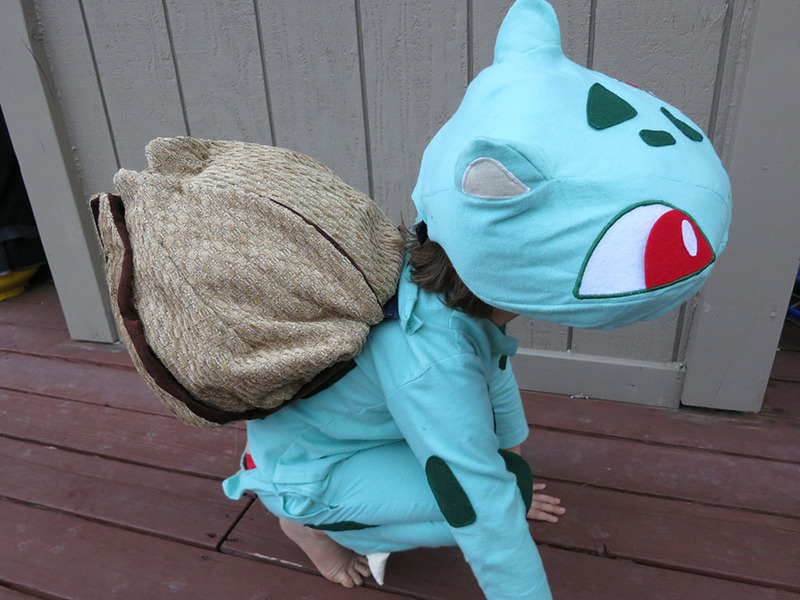 The costume was going to consist of four main elements: a shirt and pants with the proper color and markings, a hat that would be the Bulbasaur’s head, and a bulb on the back. I also got some armature wire and two small LED flashlights to build some lighted Attack Vines, but I marked that as a stretch goal. I like to incorporate lights into the kids costumes to help with Halloween safety, but I knew that the Attack Vines would stick out awkwardly. I try to build Simon’s costumes as much like normal clothing as possible. He has to wear that stuff all day, and there have been a few costumes that he’s worn throughout the year. I think kids have to be a bit older to be willing to put up with a bulky uncomfortable costume. This year I spent most of my time on his brother’s very complex Halo Master Chef costume, so I had to be able to make Simon’s costume fairly quickly. I spent two full days building his costume. On the first day, I built the shirt and pants. I just snagged one of his current shirts and a pair of pants to use as basic patterns. 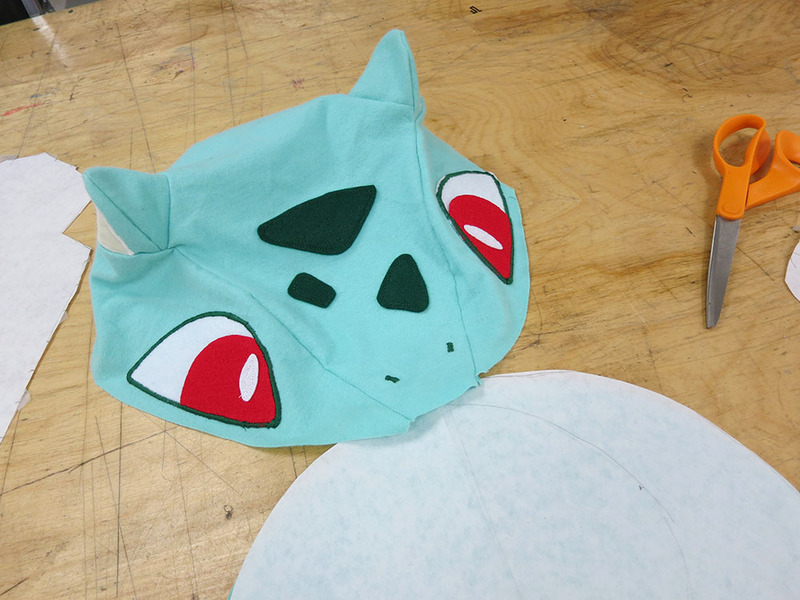 I used felt to add the Bulbasaur markings because that way I didn’t have to deal with hemming the edges. 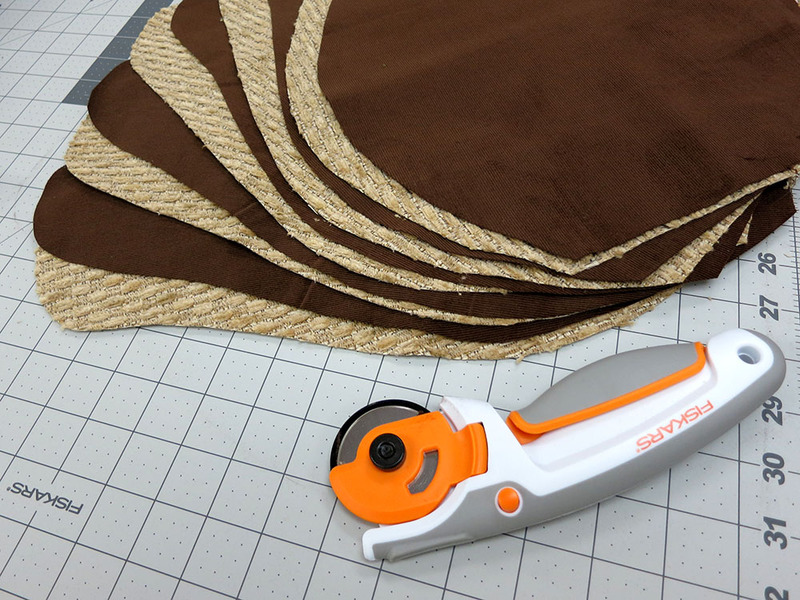 When I was making the toes for the pants, I realized I hadn’t brought any polyester fiber fill. I wasn’t going to waste an hour going to the fabric store to get some, so I just used my scissors to cut up some shreddies of material to fill the toes. It wasn’t as even as fiber fill, but the toes are small enough that it didn’t really matter. When I got home, I had Simon try on the pants and shirt. To my horror, the pants were somewhat tight. I ended up adding a small panel at the side to make them a bit bigger. He loved the feel of the fuzzy flannel and really snuggled into the new outfit. On the second day, I had to build the hat and bulb. I had gotten a black baseball cap and some kid’s backpacks from the Goodwill. I always use an actual hat as the base for these kinds of head-hats because they already have a nice adjustment mechanism built in. I spent a few hours fine tuning the pattern for the head. I went through several yards of butcher paper and a bunch of tape testing various shapes. Finally, I got something that wasn’t too complicated but seemed to capture the shape of a Bulbasaur head. I was pleased with the results. Actual Bulbasaurs don’t have a different inner ear color, but I added a cream triangle inside the ear to make the ears stand out and be a bit cuter. 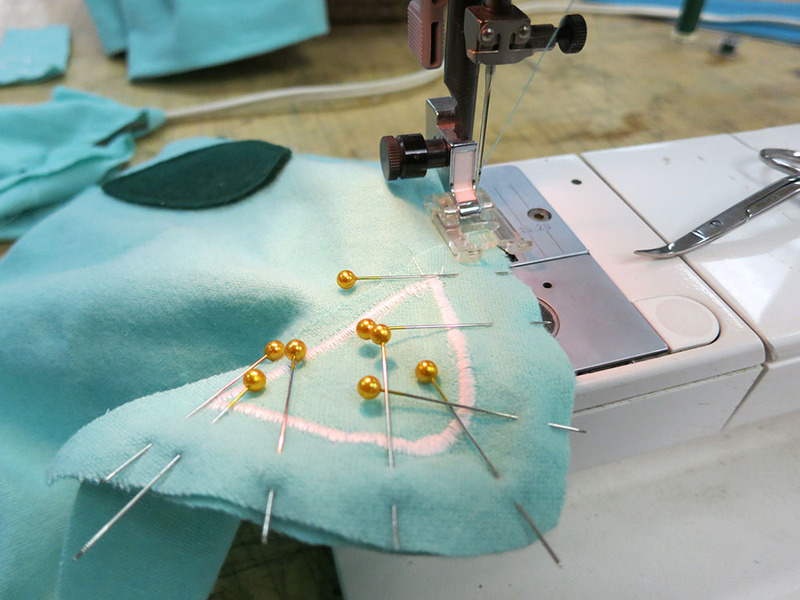 I used a very tight zig zag stitch to sort of embroider a wide line around the ear inserts, which was necessary because I didn’t have felt for that and I needed something to hem the cut edges of the cloth. I also thought it looked more cartoon-like than folding under the edges. I used the same system to put the dark green lines around the eyes. That was a bit hair-raising because at those slow feeds it’s easy to have the boarder bog down and drift away from the edge. I only had one shot. The second eye border came out better than the first. I also used that same stitch to do the nostrils. 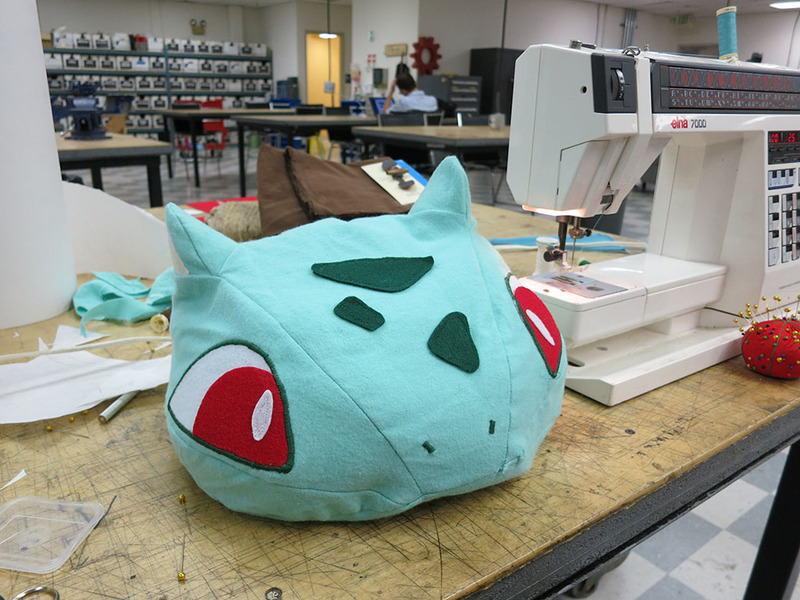 Bulbasaurs have dark lines for eyebrows as well, but I decided there was much too high a chance of screwing up his expression free-handing on some eyebrows with no good way to undo them. I did not want to end up with an angry-looking Bulbasaur. It was getting late, and I still needed to build the bulb. I made a paper “petal” and figured out what sort of tucks would give it the shape I wanted. I decided a 5-sided design would look nice and wouldn’t drive me completely crazy sewing up. I also thought 4 sides could form a bottom and 1 side to be sort of act as the top flap for the “functional backpack” goal. I cut out all 10 pieces and sewed them together. Weirdly the petals made wonderful looking ears. If I’d been working on some other costume that needed big donkey ears, I’d have been all set! Then I stitched the 5 petals together in an overlapping 5-sided ring, with the dark brown liner parts visible at each seam to add detail. Then I started looking at attaching this to one of the backpacks I’d purchased. I decided that I really didn’t want to do that. It was just too ugly to have those straps over his shoulders. So I instead sewed on a pentagonal base using my dark liner material. I figured I could add a zipper and use that to attach and remove the bulb from the shirt. Much nicer looking than straps, but he wouldn’t be able to cary much of a load in his bulb. I’d have to add the zipper later because it was late and all the sewing stores were closed. I ended up adding the zipper on the night before Halloween. I also put a beach ball inside the bulb to keep it fluffed up with minimum extra weight. I oriented the ball so the green part was the only part visible through the opening in the petals. It actually looked pretty good. I made a mistake deciding to use a dab of hot glue at the end of the cut zipper to act as a stop to prevent the slider from coming off. This seemed like a better idea than just a big glob of stitches or something, but it was a fail. For one thing, the slider sometimes stuck against the glob, and at some point during his day at school, the bulb zipper slide fell off and got lost. Oops. I’ll have to go get another donor zipper, and Simon had to go without his bulb for actual trick or treating. Oh well. Slight fail, but I doubt he would have kept that thing on all night anyway. During his day at school, Simon ripped the crotch out of his pants, but I was able to sew them back together for trick or treating. A seven year old can really do a number on slightly tight pants. I guess I should have used some sort of stronger double seam for the crotch, but I don’t really know what kind is best, and I hadn’t had problems there in previous years. That lightweight flannel just wasn’t super strong. 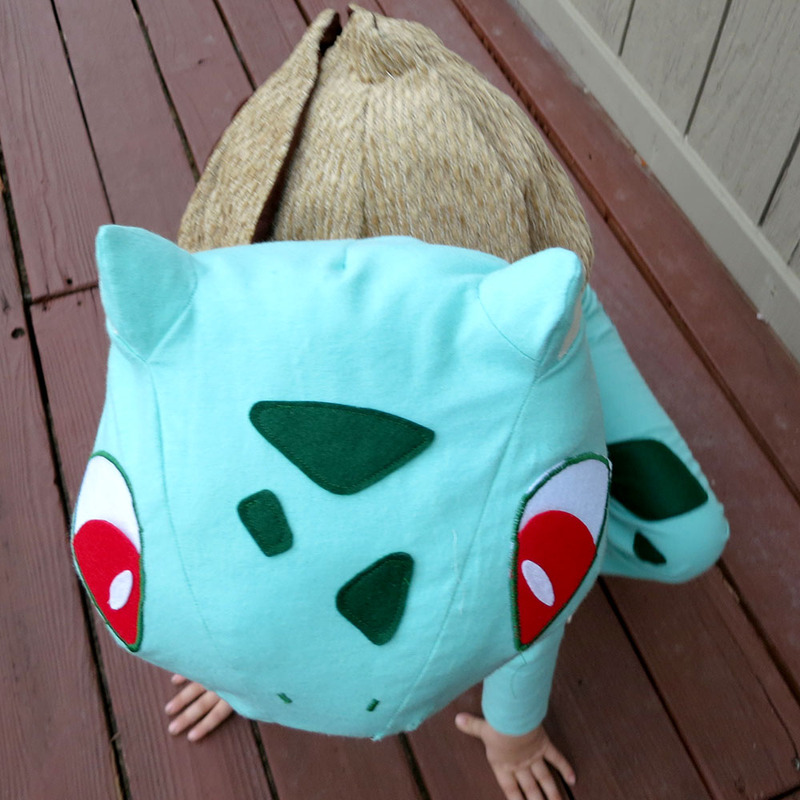 This entry was posted in Halloween Project and tagged Bulbasaur, Costume, DIY, Halloween, Sewing. Bookmark the permalink. Wow so cute and spot on for Bulbasaur! Oh. Thanks. I’m glad you liked them. I love that Halloween is a “Maker” holiday. I have so much fun doing the builds. Wow! Incredible costume. Any way to get a pattern from you?? Thanks! I don’t know about a pattern. I do there costume builds with butcher paper patterns I make up on the fly. So I probably still have a bunch of weirdly shaped pieces of paper from that build. I’ve never built anything from someone else’s patterns so I don’t know the first thing about how to make that into something someone else could use/make sense of. Would just a photo of the pieces help at all? Or is that useless? I guess in theory I could take a photo. Trace the pieces in illustrator. Label them and maybe put in some scale reference? Is that more like what people would need? That wouldn’t be fool proof because I probably made some changes on the fly and there may be some camera distortion. I’d also kind of hate to put up something that’s labeled as a “pattern” that was untested/might be disappointing. Would a sort of half assed pattern like that be useful to people? With some text disclaimers? The head would probably be a doable pattern. That would be super helpful! I normally fiddle with actual patterns anyway to get them to the sizing and stuff I need, but it’s nice to have a general idea to base it off of. 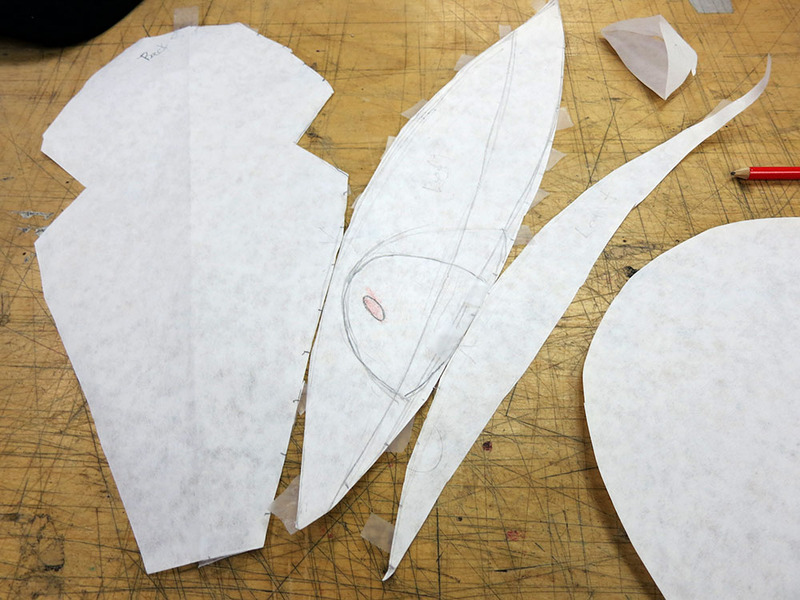 Even just a photo of the pattern pieces as you stated would be super helpful! Thanks! 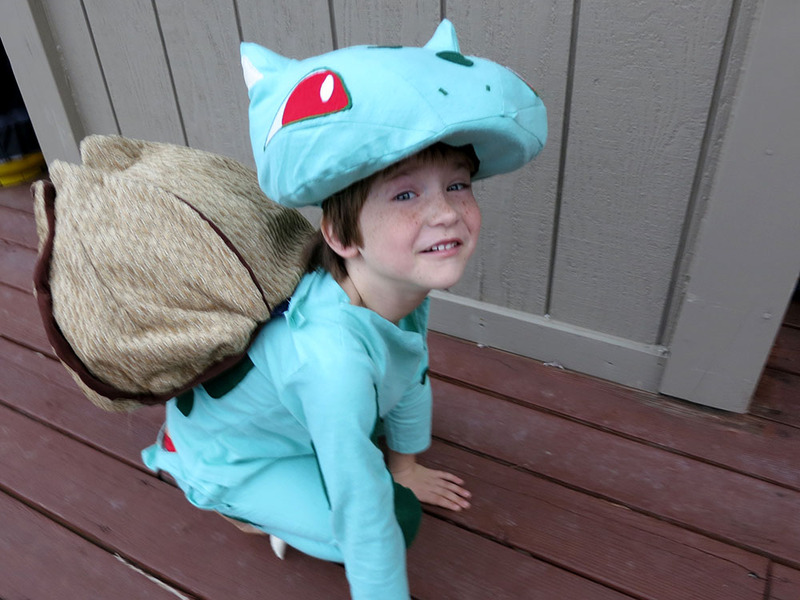 I love this costume – it’s the best DIY bulbasaur that I have seen. Also, how do you attach everything to the baseball cap? Ok, tonight when I’m home I’ll look for the paper parts and take a few pictures. I’ll have to double check how it’s attached to the cap, but I think the bottom is a hole with an area for the brim, and the hat kind of sticks in with some fiber fill on top of that. 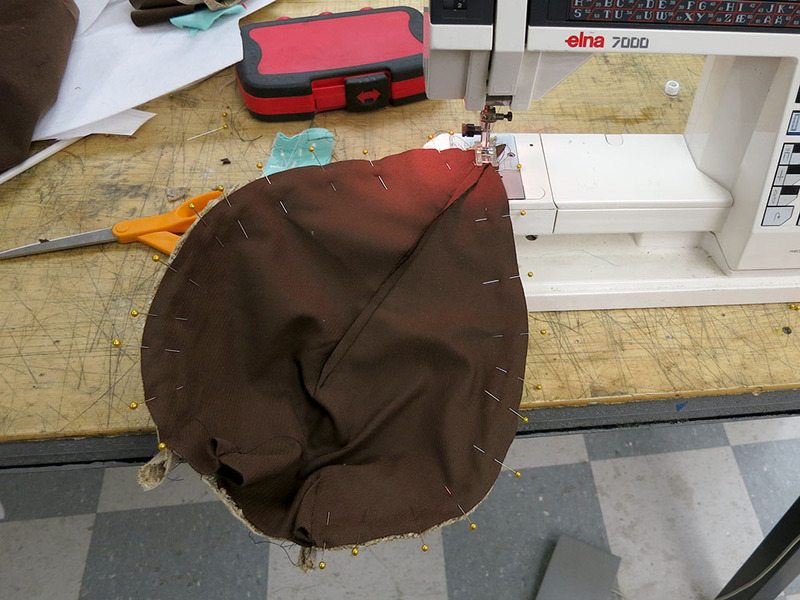 The there’s just a quick seam through the hat to the left and right of the brim, but nothing attaching it in the back so the size is still adjustable. If you build one be sure to post pix! Oy we had a plumbing problem, so I haven’t managed to take those photos yet, but I’ll be sure to get that done this weekend. Sorry about the delay. Please let us know when you have the pattern pieces and please explain or show how you attached the head to the hat. Thank you so much my grandson and I pokemon go together and I would love to surprise him with this. Ok, after much searching I was unable to find the original paper patterns, but I went though all my old photos and then used Photoshop to try and un-distort the photos of the parts and construct a set of patterns from that. This is the pattern I came up with. Be warned that there weren’t any photos with all the pieces so there is some danger that the bottom piece is a different relative size to the other pieces. To be safe it’s probably best to print them out/cut and tape them together to make sure it’s about right. 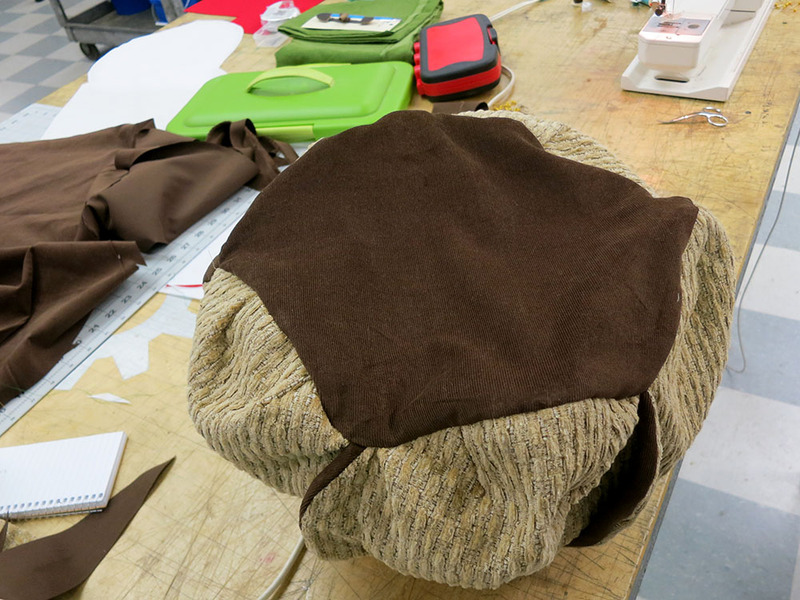 If the whole hat seems a bit low/flat try making the bottom circular piece a bit bigger relative to the other pieces. 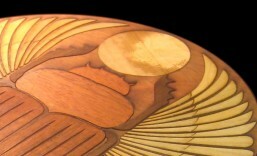 Sorry I couldn’t find the original pieces/wasn’t able to make a more precise pattern. I built that a couple of years ago, and those bits of paper probably just got thrown away. They may eventually surface, but this is the best I could do. These parts don’t include any seam allowances. So seam allowance should be added to all the parts except the eye pieces which are felt and are exact shapes already. Good luck! Post some pics if you make one! This turned out absolutely amazing!!! You definitely have some serious skills and talent! ! Thank you for sharing this with us! 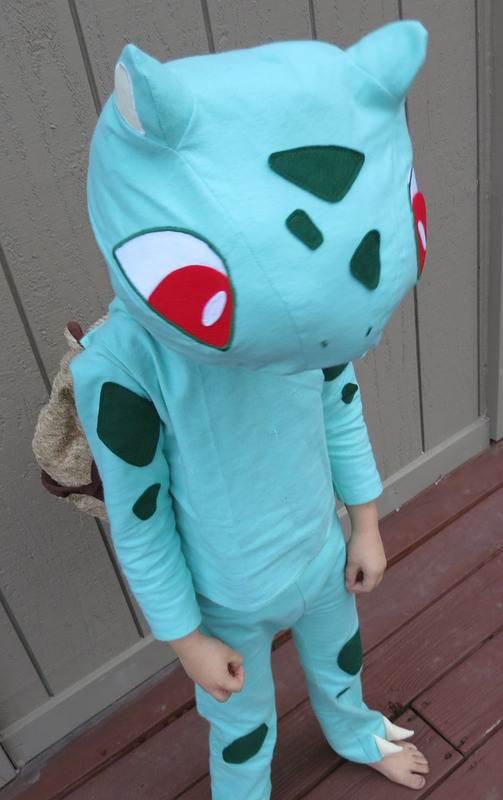 Ive been searching for ideas on how I can make my son’s costume this year..he wants to be a pokemon as well!!! He’s only 4 years old…so go figure, he couldn’t just pick a simple one! Lol so when I saw your post I had to check it out! Bc from what all I’ve came across so far, this is by far the most helpful one yet! ! Now heres the tricky part… if he just wanted to be Bulbasaur id be good to go! ! 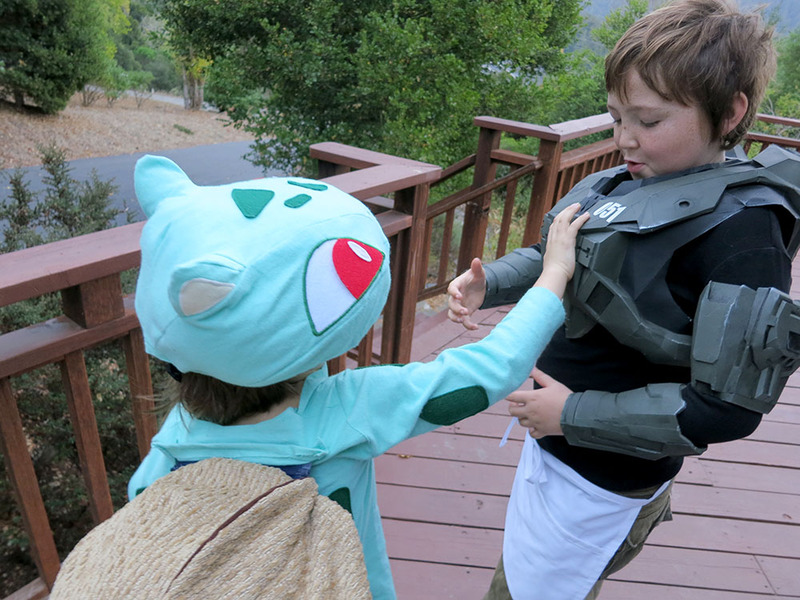 But no… he wants to be Venusaur!!! I used to sew quite a bit and was actually pretty good at it, but I haven’t used it or made anything crafty in quite a while so this is going to be very challenging for me to do but if I was successfully accomplish this for him somehow I just know it know it would mean the world to him and make him so happy!! So I guess the main reason for commenting on here is to ask you if you have any tips or suggestions that could help me make this thing come to life! Lol if not its no big deal, but I figured it wouldn’t hurt to ask! Id greatly appreciate it if you had any ideas you could share with me! ! Thank you, and again…Good work! ! Your little Bulbasaur looks awesome! !! Thanks! I’m glad you liked the outfit. I love Halloween and designing costumes! Wow Venusaur is even more complicated! 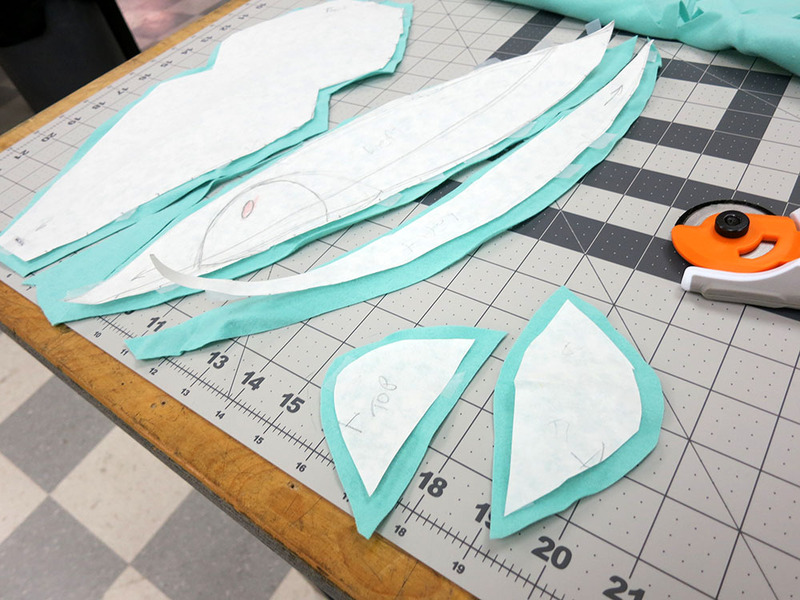 My process is usually to use a big role of butcher paper to sketch/cut out/tape together to make various patterns, and then once the ideas are worked out switch over to cloth. 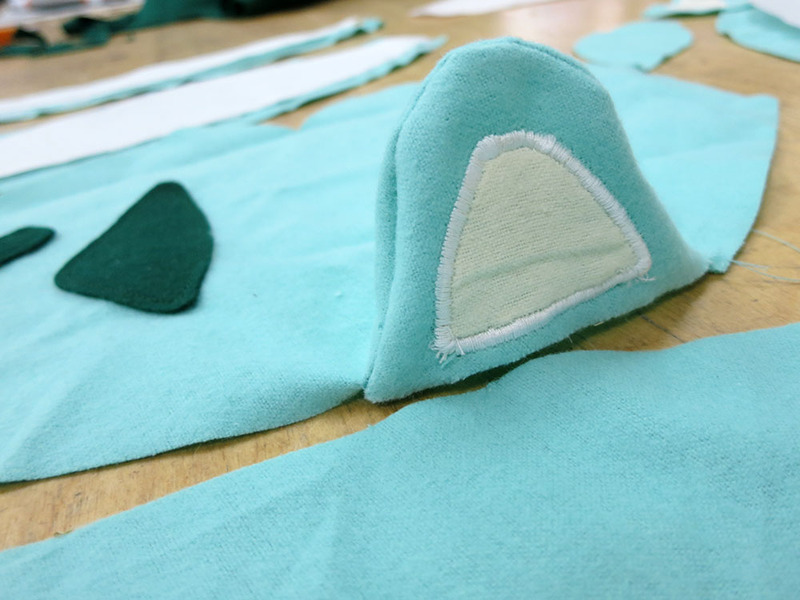 I use felt for appliqué and for things that will be hard to hem. 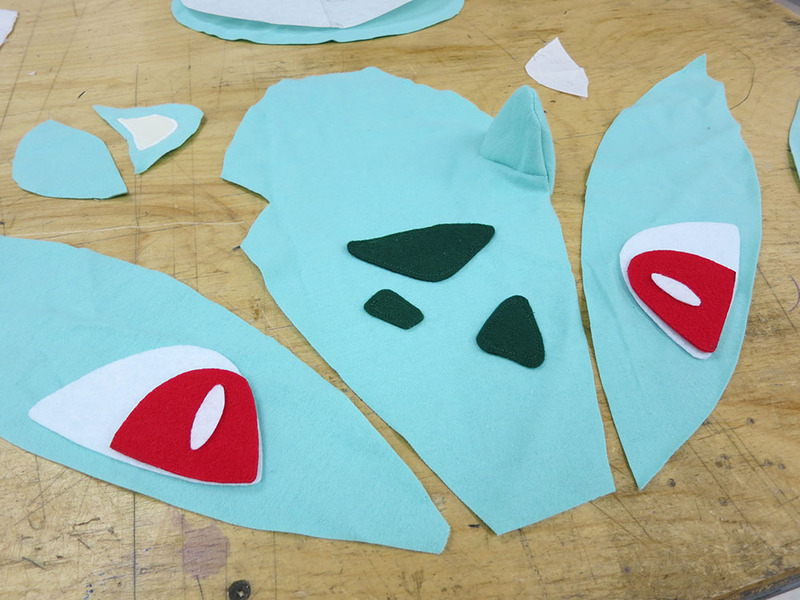 So I’d probably do the fern leaf parts from green felt and sew either another layer at the center to make the central rib, or maybe just add a seam there, or possibly some darker green piping that tapers to a point. I think because of age/child mobility I’d avoid having most of the flower actually stick up. I’d have the leaf pattern and then the petals on top of that all flat to the back, maybe with a few ends that aren’t sewn down and stick out to make it feel more independent from the back. Then I’d have the flower’s golden central cone stick out in the middle. So most of it is flat design and luckily a cone and the zig-zaggy crown part around that are fairly simple in terms of 3D shapes to figure out with paper. You can stick some fiber fill in the cone to make it stay stuck out. If you have time/want to be more complicated you could stiffen some of the petals/leaves with some bits of internal cardboard, but that adds complexity/weight/heat/possible discomfort. Which are all issues with kids. So I’d keep it structurally simple. Good luck! I hope it turns nice. Post some pics! My bulbasaur turned out super cute, but I can’t figure out how to post a picture to you.